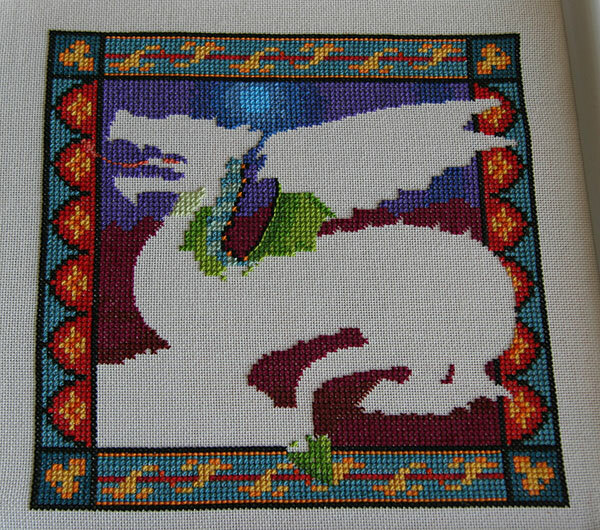 Here, finally, is the Heritage Stitchcraft Dragon after spring break and a little during the week stitching. Very colorful, isn't it? I've actually finished almost all of the background stuff (one little bit on the right is going to wait until I do the dragon over there) and have started to work in the dragon head. I didn't really plan to end up with a dragon silhouette, that's just the way it worked out! I might take a break from the dragon to do another small freebie or two for something a little different. Even through we're into spring at the moment, I have a bunch of autumn and Halloween freebies, so I figure I should stitch some now so there is an outside chance that I'll have some of them framed (or finished in some way) by the time that part of the year gets here!